Enjoy a campfire with your family and friends. 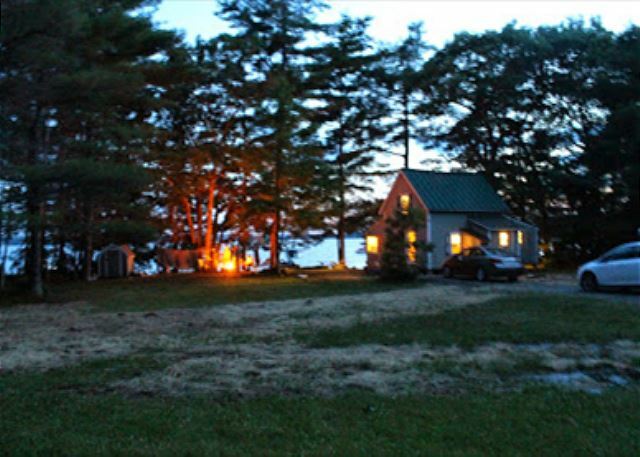 Exceptional sun sets on the shores of Great Pond, great sandy beach and large level lawn make this an ideal vacation rental for families with kids. Watch your kids play in the beach from inside the cabin. Cabin was completely remodeled in 2014. New kitchen, bath, washer/dryer, dish washer, cable TV, internet, board games for kids, well water. Relax in the hammock and make some smores at the outside fire-pit for a great camp experience. Boats can be rented at the lake. You can fish and swim right from the dock. Great Pond is known for its fine fishing, swimming and boating activites. Enjoyed a wonderful stay at this camp. Great location balanced relative seclusion and being 20 minutes from Belgrade's "downtown". Beautiful sandy waterfront allowed us to walk right into the water and dig our toes deep into the golden sand. We were finally able to teach our dog to swim using this beach! Loons and ducks were daily visitors and my 10yo son spent WAY too much time catching sunfish off the dock. Great week!! We could not have asked for a better place to spend our time this summer. A beautiful cottage with a great yard and sandy lake access. I want to go back today!! We truly enjoyed our stay at Balmy Beaches. The sandy shorefront provided easy and excellent swimming. The cottage was clean upon arrival. 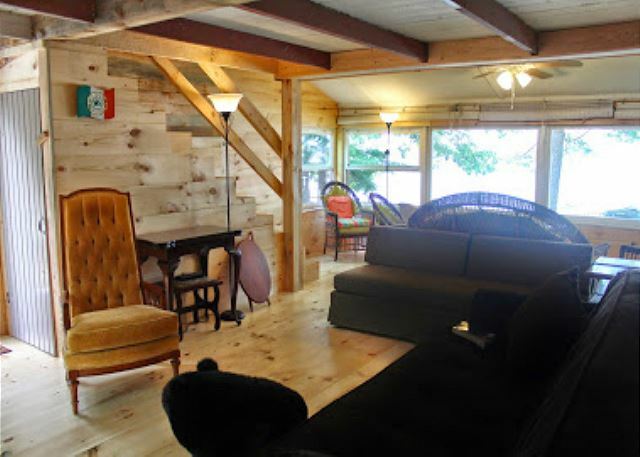 We loved the open concept of the cottage as well as the knotty pine interior. This camp exceeded our expectations from the online photos. Our family couldn't have asked for anything more from this camp & location. We look forward to coming back next year!!! 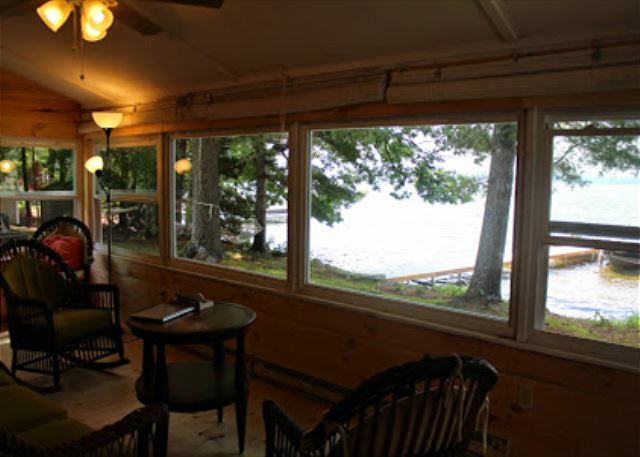 What a great cottage and fantastic water frontage! 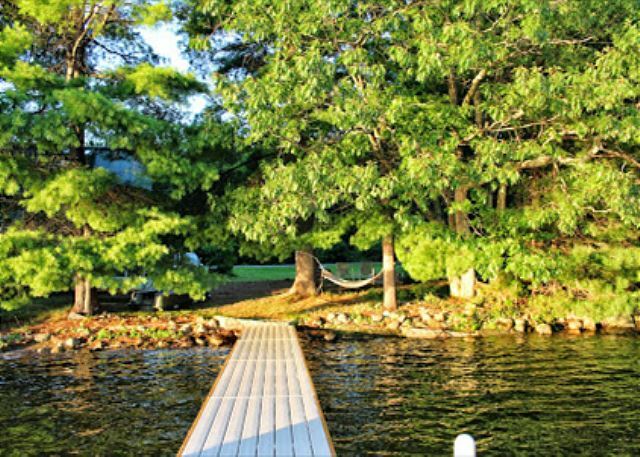 The beach is awesome, the dock is beautiful and the cottage is updated and very comfortable. Highly recommend this cottage! Love this place....full lakeside window view....soft sandy beach...gorgeous sunset views...love tge fire pit and plenty of land to move around in. Cabin very homey...plenty of space to fit 6 people...the washer and dryer are great esp. with kids. Plenty pots, pans, utensils, dishes etc. Lots of games in dresser. The dock is great for putting chairs on and sunning, feeding the family of ducks. Quiet and peaceful. Just love this cabin and lake! Balmy Beach...a family vacation haven! 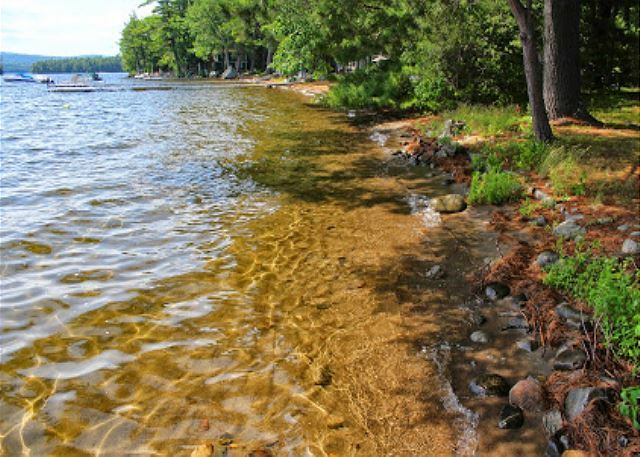 The cottage is situated on a beautiful expansive piece of land that allowed us to set up a chrochet course and batmitton/volleyball court at the same time. The firepit was great and more than enough room for sitting 6-8 Chairs and wonderful for kids to do smoars. The picnic table was large enough for 8 people and overlooks the lake. The dock was great for sunning, hooking up water floats and a boat. The cottage was just as roomy and oh so welcoming. We slept 6 with more than enough room. Downstair couches folded out to full beds. Upstairs the twin bed area had enough room to set-up a pack in play for young toddlers or a play area. The 2nd bedroom was very comfortable. We arrived in early june so a bit chilly but the heating system made it cozy and comfortable in no time. Love the wall of windows facing the lake...full view of kids playing in the sandy beach which toddlers can enjoy as it remains low depth nearly all the way to the end of the dock. Just need to step over a few smooth rocks to get to all sand. 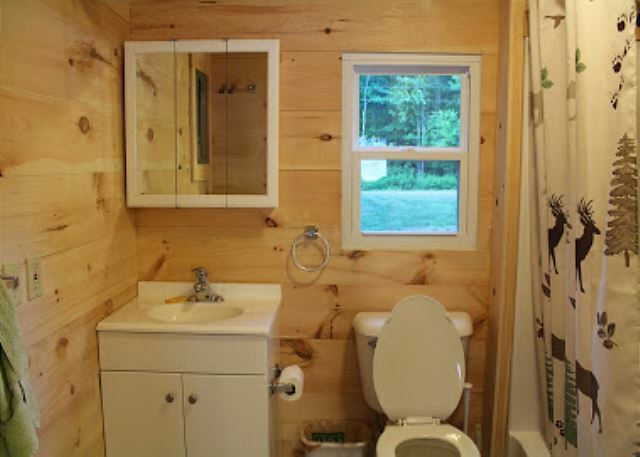 The bathroom has both a shower and tub with plenty of hot water. The kitchen has everything you need...dishwasher, microwave, Toaster, coffee maker and full fridge. More than enough dishes, pots and pans etc. Love the long kitchen bench situated next to the long kitchen island...makes conversation easy when cooking breakfast. The roomy grill outside allows enough room to cook three racks of ribs. Cable tv and internet available, Its a smart TV...which we were not...took some time to learn how to use but so many family games available to play in the tall dresser. The washer and dryer unit are a god send with kids in and out of water. Need to bring your own drinking water as the well is not biggy. Absolutely love this cottage...and the people you deal with booking this wonderful home away from home. Will definately book again and again. The cabin and property were very nice and cozy. We enjoyed our stay very much. The cottage is newly renovated. 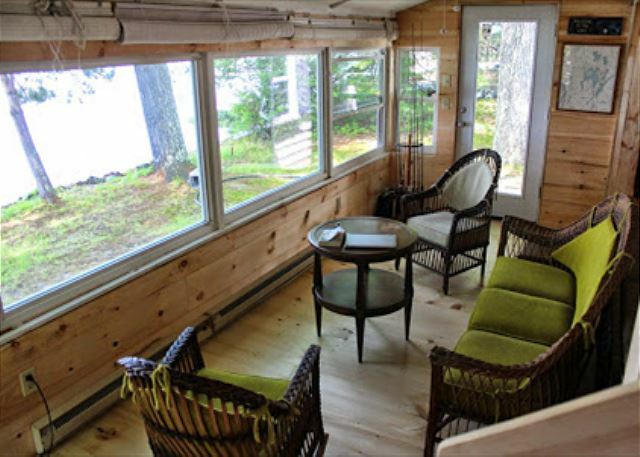 It has all the conveniences of home plus a nice quiet spot on the lake. The views from the dock are expansive and yet you feel sheltered from the surrounding cottages. There is a green lawn to play badminton or crocquet. Belgrade Vacation Rentals do a terrific job taking care of you. I've booked with other agents but this is by far my best experience.